equally famed Mungo Martin possibly also worked on the pole as an apprentice. a Kingfisher (kədalawi). This is followed in order by human (bəǧwanəm), wolf (uligən), humpback whale (ǧwəyəm), river otter (Xwəmdi) – though here again, there is some question and perhaps this is black bear (λa?i), great horned owl (textexalił), and at the base is Numas, first man (gəlgəlis - first to walk in this world), who holds the people of the Tlowitsis Nation up. Family history recounts that Smith Siwid dedicated the pole at a p̓əsa, now referred to as a potlatch, to demonstrate that its crests confirmed his descendent claim as chief. A potlatch is a ceremonial feast given in order to commemorate significant community or life events. On these occasions the hosts distribute gifts to those invited in order to establish or reaffirm social status. The Smith Family Totem Pole originated on Turnour Island, British Columbia, Canada when Chief Smith Sewid or Sewidanaquilla commissioned Charlie Yakuglas James. In 1941 two poles stood in the village; by the end of the year both had disappeared. Frank Hibben, an assistant professor in the Department of Anthropology at the University of New Mexico, purchased one of the poles, but possibly not the Smith family pole. The truth is, the pole was take illegally. When the pole disappeared from the village, members of the Tlowitsis Nation filed a crime report with the Canadian police. Hibben towed the pole to Ketchikan, Alaska and described it as Tlingit to bypass questioning at the U.S.–Canadian border. From the 1960s until April 1, 2017 the pole was displayed on the campus of the University of New Mexico without interpretation connecting the pole to the community from which it was taken, and for whom it has continuing significance. The totem pole was removed from its origins at a time when anthropologists visited indigenous communities internationally to collect material culture as part of salvage ethnography, which is the recording of the practices and folklore of cultures allegedly threatened with extinction, including as a result of modernization. (In practice, many of those cultures have survived.) Salvage ethnography is generally associated with the American anthropologist Franz Boas; he and his students aimed to record “vanishing” Native American cultures. Objects from indigenous peoples were identified as having value for research and also to begin to develop collections for museums. of Anthropology, Curator of Ethnology Lea McChesney moved forward with contacting the Tlowitsis Nation and Chief Danial Smith. At the 2015 Society for Applied Anthropology meetings in Vancouver, a community meeting was held with Chief Danial Smith and Chief John Smith and representatives of the Tlowitsis Nation, Beverly Singer, India Rael, Devorah Romanek and Lea McChesney, about what the Maxwell should do about the pole. The Tlowitsis Nation requested the pole stay at the University of New Mexico, be restored, appropriately renamed for the Smith family, that contextual information be included and that the University acknowledge the wrong that was done in removing the pole. over the Museum, lowered and placed in a cold storage container adjacent to the Musesum for two weeks in order to eliminate insect infestations. On April 15, the pole was moved into the Hibben Center atrium, where a team led by conservator Landis Smith and including conservators Mina Thompson and Harriet Raeburn cleaned, brushed, removed debris and previous restoration materials. The totem pole is placed into cold storage Conservators Landis Smith (center), Mina Thompson and Harriet Raeburn. pieces, primed and repainted the pole. The pair worked long hours over a three-week period. On May 20, the restored Smith Family Totem Pole was raised in the Hibben Center. 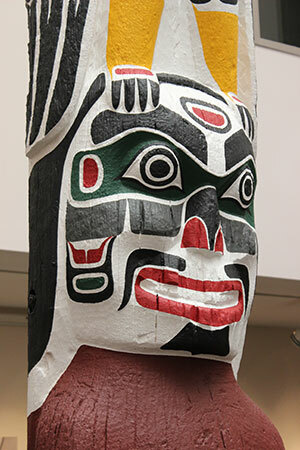 Kwakwaka’wakw artist and lead carver Tom Hunt, Jr. Bertran Smith reproduces the original design over the primed totem pole. primes the totem pole in preparation for repainting. Chair of the Department of Anthropology also welcomed attendees. University of New Mexico President Chaouki Abdallah apologized to the Smith family for the troubling history of the totem pole at UNM. The Smith family delegation performed traditional dance and song to honor the pole and their ancestors. The final dance was a community dance and all attending were invited to participate. Chief Danial Smith dances at the Blessing Ceremony. of Kwakwaka’wakw artists can learn about Charlie Yakuglas James’ carving style and access the pole’s history and cultural legacy. Willam Wasden, Jr. and Harold Nelson Tlowitsis & Smith family, right to left: Emily Aitken, Aysha Smith, Andrea Alfred- Smith, Sherry Thomas & Shana Smith, honor the Smith Family Totem Pole and their ancestors. we’re feel very blessed and happy. Thank you for the hard work, the dedication, that has been put in to make this day happen, to peacefully correct what had happened in the past, and thank you from the bottom of our hearts. This is from me and my family. I’m Chaouki Abdallah, Interim President of the University of New Mexico. It is my honor to be addressing you this afternoon. It is important to acknowledge past mistakes before moving forward. Today I acknowledge the University’s involvement in the appropriation of the beautiful and culturally important totem pole belonging to Chief Smith Sewid’s family ofthe aboriginal village of Kalagwis on Turnor Island in British Columbia. The totem pole was presented to UNM in the 1940’s by one of its faculty and the University at that time failed to carry out due diligence regarding its ownership or examine the propriety of its removal. No attempt was made to present the indigenous social-cultural context and meaning and this was a missed opportunity for the UNM community. The treatment of the pole between then and now is something we should have handled also much differently and we regret. While we cannot erase this record, we can acknowledge our past failures and express our sincere regrets to you, your family in atonation of these actions. Please accept our formal and sincere apology and know that we will work with you to insure the care and interpretationof the Smith family’s pole according to the family’s wishes. The Maxwell Museum of Anthropology in collaboration with the UNM Department of Anthropology and the Tlowitsis Nation has begun fundraising to establish a replica totem pole in the Tlowitsis Nation reserce near Campbell River, British Columbia. Please support the effort and contact Mary Beth Hermans 505 277-1400 , mhermans@unm.edu for details. The Tlowitsis are one of the thirteen Kwakwaka’wakw (Kwakwakaw̓akw) nations, who live in coastal British Columbia, at the north end of Vancouver Island and on the adjacent islands and mainland. Currently the nation has 400 members. The Smith Family totem pole was originally raised in the Tlowitsis winter village of Kalagwees (Qaloǧw is curved beach), onTurnour Island. During the mid-twentieth century, the British Columbia government closed the school and stopped the monthly hospital ship to the island. A diaspora resulted, displacing the community from their traditional home. Today, the Tlowitsis lease a plot of land for their administrative office from Homalco First Nation who were relocated to Campbell River.